Introduction Recently, the benefit of selecting patients for endovascular treatment (EVT) beyond the 6-hour time window using a tissue-based approach was demonstrated in two randomized trials. The optimal imaging protocol for selecting patients is under debate, and it is still unknown if a simpler and faster protocol may adequately select patients with wake-up stroke (WUS) and late-presenting stroke (LPS) for EVT. Objective To compare outcomes of patients submitted to EVT presenting within 6 hours of symptom onset or 6–24 hours after last seen well, selected using non-contrast computed tomography (NCCT) and CT angiography (CTA). Methods An observational study was performed, which included consecutive patients with anterior circulation ischemic stroke with large vessel occlusion treated with EVT. Patients presenting within 6 hours were treated if their NIH Stroke Scale (NIHSS) score was ≥6 and Alberta Stroke Program Early CT score (ASPECTS) was ≥6, while patients presenting with WUS or 6–24 hours after last seen well (WUS/LPS) were treated if their NIHSSscore was ≥12 and ASPECTS was ≥7. Results 249 patients were included, 63 of whom were in the WUS/LPS group. Baseline characteristics were similar between groups, except for longer symptom-recanalization time, lower admission NIHSS (16 vs 17, P=0.038), more frequent tandem occlusions (25.4% vs 11.8%, P=0.010), and large artery atherosclerosis etiology (22.2% vs 11.8%, P=0.043) in the WUS/LPS group. No differences in symptomatic intracranial hemorrhage, peri-procedural complications or mortality were found between groups. Three-month functional independence was similar in both groups (65.1% in WUS/LPS vs 57.0% in ≤6 hours, P=0.259) and no differences were found after adjustment for confounders. Conclusions This real-world observational study suggests that EVT may be safe and effective in patients with WUS and LPS selected using clinical-core mismatch (high NIHSS/high ASPECTS in NCCT). Wake-up stroke (WUS) represents approximately 20% of strokes1 and, together with late-presenting stroke (LPS, 6–24 hours from symptom onset/last seen well), they comprise an important group which, until recently, was not considered eligible for reperfusion treatments based on a single factor: time.2–4 However, ischemic stroke is a dynamic condition in which the rate and extent of brain infarction depend on multiple factors—namely, collateral blood flow.2–6 DAWN7 and DEFUSE 38 trials, using perfusion-based imaging protocols, recently showed the benefit of endovascular treatment (EVT) in selected patients presenting >6 hours after last seen well with a relatively small infarct volume and a significant volume of ischemic penumbra. We are therefore witnessing a shift to a new stroke treatment era, based on a tissue-window approach, in which baseline imaging characteristics can be used to select patients for reperfusion therapies. However, the optimal imaging protocol to select these patients is still a matter of debate.9–13 Non-contrast computed tomography (NCCT) has proved to be a valuable diagnostic tool in acute stroke, with good sensitivity14 and specificity15 in the definition of infarct core due to anterior circulation large vessel occlusion. The aim of this study was to analyze our experience with EVT in patients with ischemic stroke presenting with WUS/LPS using an imaging protocol based on NCCT and CT angiography (CTA) and to evaluate the safety and efficacy of EVT. A prospective single-center observational registry study of consecutive patients with acute ischemic stroke submitted to EVT for anterior circulation large vessel occlusion between January 2015 and July 2017 was undertaken. EVT was routinely performed in patients with time from symptom onset to groin puncture <6 hours if the following criteria were met: age ≥18 years, baseline modified Rankin Scale (mRS) score <2, admission National Institutes of Health Stroke Scale (NIHSS) score ≥6, Alberta Stroke Programme Early CT Score (ASPECTS) ≥6 on NCCT, CTA with a large vessel occlusion (intracranial internal carotid artery (ICA), M1 or proximal M2 segments of middle cerebral artery, including tandem occlusions). In patients with WUS/LPS, EVT was performed if the following criteria were met: age ≥18 years, baseline mRS score <2, NIHSS score ≥12, ASPECTS ≥7, and CTA with a large vessel occlusion. The imaging protocol was identical for both groups and included NCCT to assess infarct core and ASPECTS, and CTA to determine the occlusion site. Treatment decisions were discussed by a vascular neurologist and an interventional neuroradiologist who reviewed all images before performing the treatment. EVT was performed in most cases with the Trevo stent retriever device (Stryker, Kalamazoo, Michigan, USA) or alternatively with thromboaspiration devices (Penumbra, Alameda, California, USA) at the discretion of the interventional neuroradiologist. All patients were subsequently admitted to the stroke unit or, when required, to the intensive care unit. WUS was defined as stroke symptom onset on awakening and time to treatment was defined using the time since last seen well. Demographic information, clinical characteristics, imaging results, and procedural details were collected from the registry. Successful recanalization was defined as a score of 2b or 3 on the modified Treatment In Cerebral Ischemia (mTICI) scale. Collateral status on baseline cerebral angiography was retrospectively evaluated using the same scale as in the SWIFT trial16 and classified as poor (grades 0–2) or favorable (grades 3–4) by one of the authors (MR), blinded to the timing of treatment and 3-month outcome. Symptomatic intracranial hemorrhage (sICH) was defined according to ECASS II criteria.17 Information regarding peri-procedural complications, mortality, and 3-month functional outcome (mRS assessed in person by vascular neurologists) was collected from the clinical records. Favorable clinical outcome was defined as 3-month functional independence (mRS score ≤2). Statistical analysis was performed using SPSS V. 23.0. Pearson’s χ2 test, Fisher’s exact test, and the Mann–Whitney U test were used to compare groups, as appropriate. We calculated unadjusted ORs and 95% CIs for the time between symptom onset and recanalization, and timing of treatment (≤6 hours as reference vs WUS/LPS) using the 3-month functional outcome as the dependent variable. We additionally constructed multivariate binomial logistic regression models to sequentially adjust ORs for the effect of variables known to influence functional outcome. The significance threshold was set at an alpha value of 0.05. This study was approved by the Ethics Committee of Centro Hospital de Vila Nova de Gaia/Espinho, which waived the need for a formal separate consent for participation in this study. Individual patient consent for EVT was obtained from all patients or next-of-kin according to institutional recommendations. During the study period, 252 patients with acute ischemic stroke underwent EVT due to anterior circulation large vessel occlusion, 90.1% with stent retrievers. Three patients were lost to follow-up. Sixty-three patients (25.3%) were treated outside the 6-hour window, 34 with WUS and 29 with LPS. Baseline characteristics, treatment details, and clinical outcomes of both groups (≤6 hours vs WUS/LPS) are summarized in table 1. In addition to the significantly shorter time since last seen well to groin puncture in the group treated within 6 hours (median 238 vs 513 min, P<0.001), the only baseline differences observed between groups were a lower admission NIHSS score (median 16 vs 17, P=0.038) and a higher frequency of tandem occlusions (25.4% vs 11.8%, P=0.010) and large artery atherosclerosis etiology (22.2% vs 11.8%, P=0.043) in the WUS/LPS group. Collateral status assessment was not possible in 78 patients (31.3%) because of internal carotid artery occlusion precluding collateral visualization with ipsilateral carotid injection, absent venous phase images, inadequate field of view for complete collateral assessment, and poor quality images due to movement artifacts. The frequency of favorable collateral status was similar in patients treated within 6 hours (n=70, 55.1%) and in WUS/LPS patients (n=26, 59.1%) (P=0.647). However, it was numerically higher in LPS patients alone (n=14, 66.7%), although this difference was not statistically significant. Approximately one-third of patients in the WUS/LPS group was submitted to intravenous thrombolysis (IVT): 54.5% of these patients were treated with IVT in the primary stroke center within the 4.5-hour time window and the remaining patients were treated with IVT after the decision of the treating vascular neurologist. Successful recanalization was achieved with a similar frequency in both groups (89.2% vs 95.2%, P=0.156), with an identical number of passages of the stent retriever, comparable peri-procedural complications, and sICH frequency (4.3% vs 3.2%, P=1.000). There were no significant differences concerning 3-month mortality (15.6% vs 7.9%, P=0.126) or favorable 3-month outcome, which was achieved in 57.0% of the patients treated within 6 hours and in 65.1% of the patients with WUS/LPS (P=0.259). 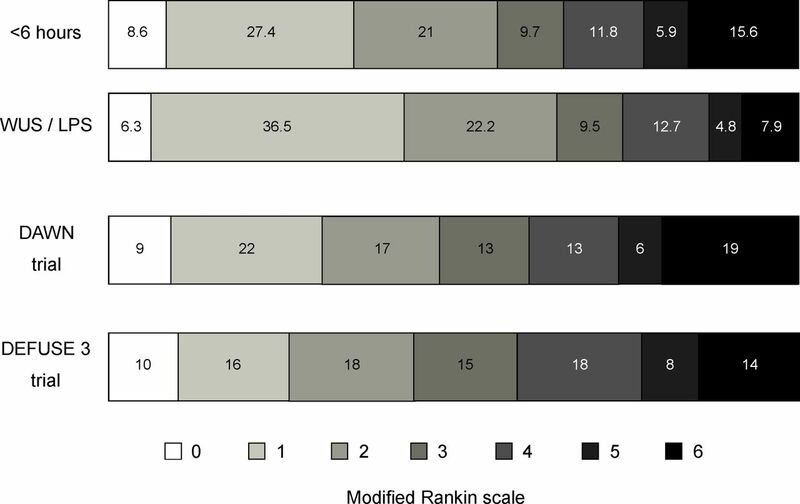 The distribution of the 3-month mRS score after stroke is shown for both groups in figure 1, and is presented together with the distribution of the 3-month functional outcomes in the intervention groups of the DAWN and DEFUSE trials. Additionally, we did not find any statistically significant difference concerning outcomes when comparing WUS with LPS (table 2). Three-month modified Rankin Scale distribution of patients with wake-up stroke (WUS) and late presenting stroke (LPS) and patients treated within 6 hours in the present study and in the intervention groups of the DAWN and DEFUSE 3 trials. In the univariate analysis, the timing of treatment according to the defined groups (≤6 hours as reference vs WUS/LPS) was not predictive of 3-month functional outcome (OR 1.41, 95% CI 0.78 to 2.55, P=0.260). In the multivariable logistic regression model, adjustment for baseline clinical variables, treatment with IVT, and collateral status did not change the results significantly (table 3). Age, admission NIHSS and ASPECTS scores were found to be independent predictors of 3-month outcome, and favorable collateral status was also associated with 3-month functional independence, although not significantly (table 3). To further explore the predictive role of time in the treatment of the whole population, we performed multivariable logistic regression analysis adjusted for baseline clinical variables for treatment with IVT and collateral status and found that time between symptom onset and recanalization was not a predictor of 3-month functional independence (adjusted OR per each 15 min increase of 1.00, 95% CI 0.98 to 1.03, P=0.885) (see online supplementary table 1). Our study showed that, in a real-world setting, the selection of patients with WUS or LPS for EVT based solely on clinical characteristics, NCCT, and CTA resulted in similar rates of successful recanalization, sICH, favorable 3-month outcome, and 3-month mortality as in patients treated with EVT within 6 hours of last seen well. Recently, Motyer et al 29 reported a retrospective case series of 25 patients with acute ischemic stroke submitted to EVT beyond 12 hours of last seen well, selected by NCCT-ASPECTS and multiphase CTA to assess collateral status, and showed good functional outcome in 52% of patients and acceptable safety. For patients with LPS, poor collateralization—a marker of fast infarct growth30—is indicative of a high likelihood that the ischemic lesion is already completely established, and it has been clearly associated with poor outcomes even with successful recanalization.31 In our study, the proportion of patients with favorable collateral status in the group treated within 6 hours was similar to the WUS/LPS group. However, it was numerically higher in patients with LPS, which could suggest a link between relatively small recent ischemic changes and favorable collaterals in patients with large vessel occlusion presenting >6 hours after symptom onset. Our selection criteria did not include collateral assessment, and we did not find that collateral status was predictive of 3-month outcome, but the study population size (specifically of the LPS group) may have limited this analysis. Further studies are needed to clarify the benefit of collateral status assessment for selecting patients with LPS for EVT. The main limitations of our observational study are the small sample size of the WUS/LPS group, absent information on patients who did not meet the selection criteria, outcome assessment by the treating physician, and absent information on collateral status in almost one-third of the patients. Our results suggest that EVT is feasible and may be safe and beneficial in patients with ischemic stroke presenting beyond the 6-hour time window selected according to a tissue-window approach that only uses NCCT and CTA. More studies using fast and simple imaging selection protocols are needed to confirm their utility in the selection of patients for EVT who present >6 hours after symptom onset. European Stroke Organisation (ESO). Karolinska Stroke Update Consensus Statement on mechanical thrombectomy in acute ischemic stroke in collaboration with E and E. 2014 https://eso-stroke.org/wp-cont_ent/uploads/2016/09/ESO-Karoli_nska-Stroke-Update-2016-Recomm_endations.pdf. European Stroke Organisation (ESO). Karolinska Stroke Update Consensus Statement on revised guidelines for intravenous thrombolysis. Should the time window for intravenous thrombolysis be extended? 2008. http://www.strokeupdate.org/Cons_thrombolysis_2008.aspx. Contributors TS, JP: study design, data collection, statistical analysis, and writing the manuscript. AC, MR: data collection and writing the manuscript. AAC: study design, data collection, and writing the manuscript. TG: statistical analysis and writing the manuscript. LP, HC, JMR, MV, SC, MR: study design and correction of manuscript. PB: study design, data collection and correction of manuscript. Ethics approval Comissão de ética do Centro Hospitalar Vila Nova de Gaia/Epinho. Data sharing statement Any information regarding unpublished data can be made available, opon request, by the corresponding author.